Thanks to the lovely people over at Google, we have integrated the Google Maps service into NetHelpDesk to help plot your Customers and staff on a full featured, beautifully designed map plugin. Plotting your Customer locations from their addresses, and where you staff are whilst on the move using the GeoCoordinates generated from the Smartphone app on Google Maps is such a simple yet powerful tool. The feature, included as standard, as are all other features in NetHelpDesk, allows you and your teams to track open tickets in all areas, and so easily delegate work efficiently based on location. This kind of software, to track locations and directions, is very expensive, where with NetHelpDesk, it's part of what you already pay for, all in one place. Plot Customers using their GeoCoordinates with Google Maps view in main interface with streetview too. Use their street address from the Site record to populate those GeoCoordinates for journey planner. Include all Customers on the overview, to view from any region of the world via Google Maps interface. Exclude Customers who do not have current tickets open, if required, so as to simplify your screens. Include Staff locations using GPS Location coordinates sent from the Smartphone apps to the database for tracking. Show Client Labels, so you and your team members know which customer is where, simply, clearly and easily. 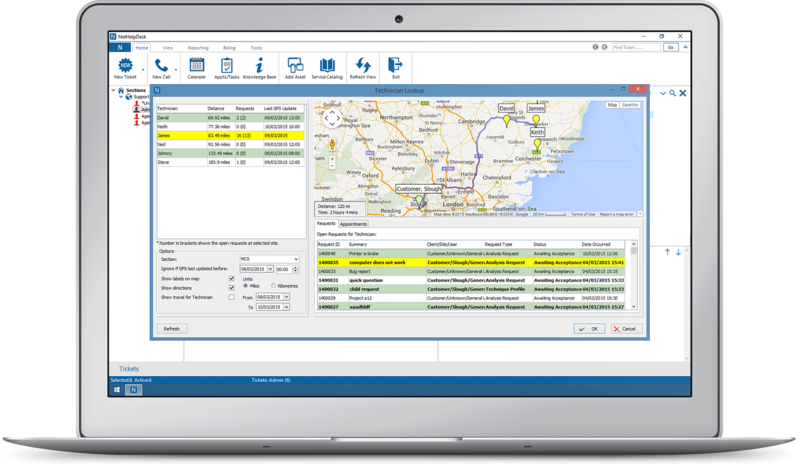 Look at the requests and appointments to plot your team's routes for the day, or whilst on the move for efficiency. Plot the travel paths of staff in between two set dates using Google Maps mileage for journey planning and expenses. Use the Street View Pegman to access areas with street view imagery available, just as you would in your standard web browser. Show Staff Labels, so you know who is where, simply, clearly and easily, to co-ordinate staff on the road as you go. Set a refresh interval in seconds, to show up to date information of locations in realtime, for accuracy of planning. Send details of appointments booked to your end-users of estimated time of arrival, and duration on site. 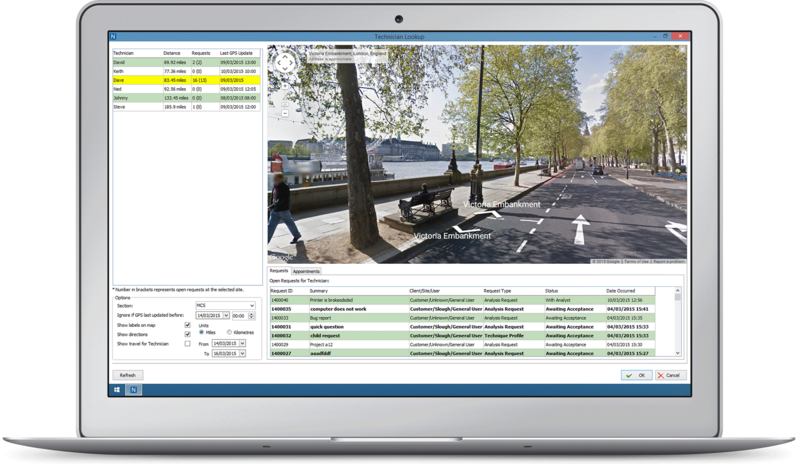 Not only keep costs down for mileage and journey time, but improving the speed of service to your end-users and allowing teams to use all the features of Google Maps to direct teams to the correct location. Using features like the Street View, to see local landmarks, and guide mobile users, or send details to their Google Maps app on their phone, to plot journeys, estimate journey times and so on. Using the GeoCoordinates from the Smartphone app also lets you track locations of staff, to ensure they are maximising their time, and not wasting it in a nearby fast food drive thru establishment.